The pulp era's most bloodthirsty avenger continues his deadly war against crime in two violent pulp novels by Norvell Page. First, "The Mad Horde" of rabid creatures is unleashed upon mill towns to undermine America's vital steel industry. 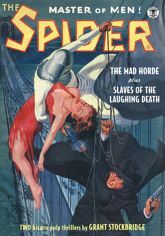 Then, in "Slaves of the Laughing Death," the fiend of 1,000 faces (known only as "Munro") returns for a deadly rematch with the Spider, armed with a deadly weapon that causes victims to laugh until they die! This double novel pulp reprint showcases the classic color covers by Rafael De Soto and John Newton Howitt, John Fleming Gould's classic interior illustrations, and historical commentary by Will Murray.